Asparagus season could be extended for months if it were up to me! 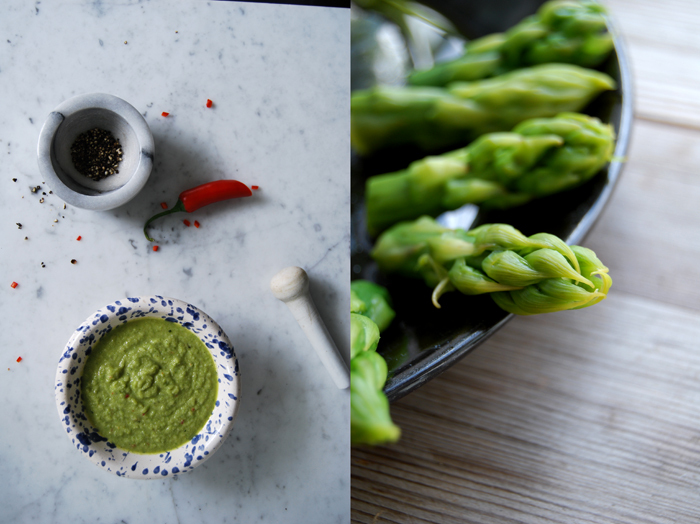 So many recipes bring out different sides of this vegetable, especially the green asparagus, it’s so versatile thanks to its strong taste. This one is a pesto, light and fresh with a smooth texture, almost velvety. The preparation is the same as the broccoli pesto I made in March, the cooked vegetables are mixed with some of the water they are cooked in. I added garlic, fresh hot chili peppers, tarragon (my herb of the month) and anchovies. The fish adds a soft saltiness which only makes this composition complete. 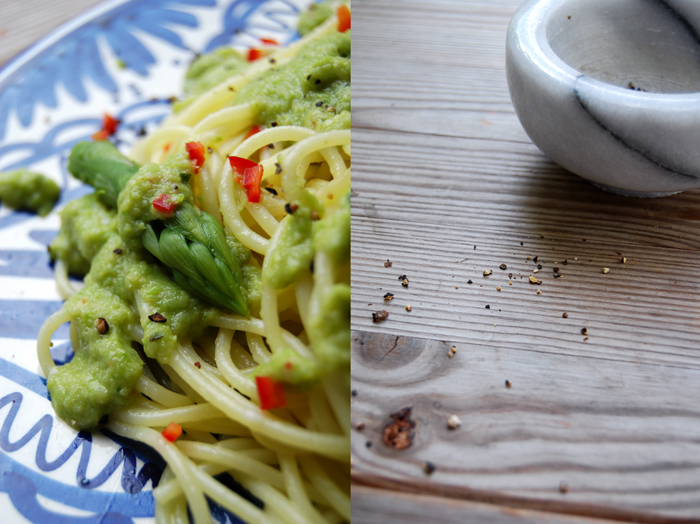 I once made this pesto without as I had run out and it really wasn’t as good. I use 4 anchovies for 500g (1 pound) of asparagus, I originally started with just 2 when I made it the first time. I thought they would be too strong for the pesto but sometimes in cooking you shouldn’t be shy, being brave is the key to success! For this meal it’s best to warm the plates in the oven. In a large pot, cook the asparagus in lots of salted water for 7 minutes. 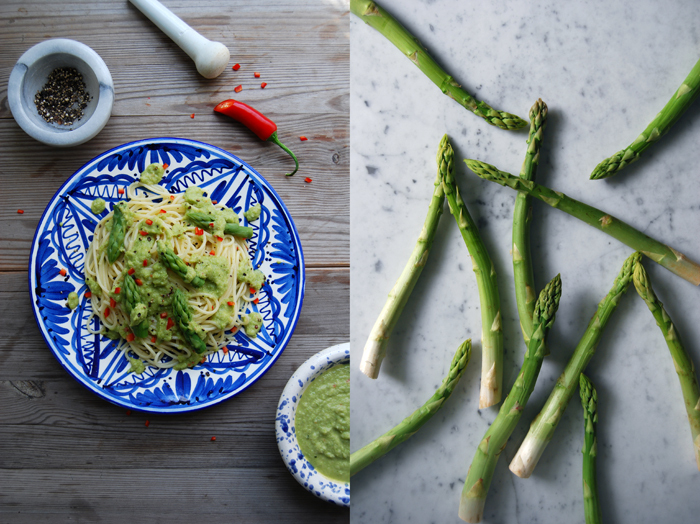 Keep the water, take the asparagus out with a slotted ladle and cut into 3cm / 1″ pieces. Set the heads aside and leave for the topping. Purée all the ingredients for the pesto in a blender (except the asparagus’ heads and the chili peppers for the topping). Season with salt (carefully, I didn’t need to add any because of the salty fish), pepper and lemon juice to taste. 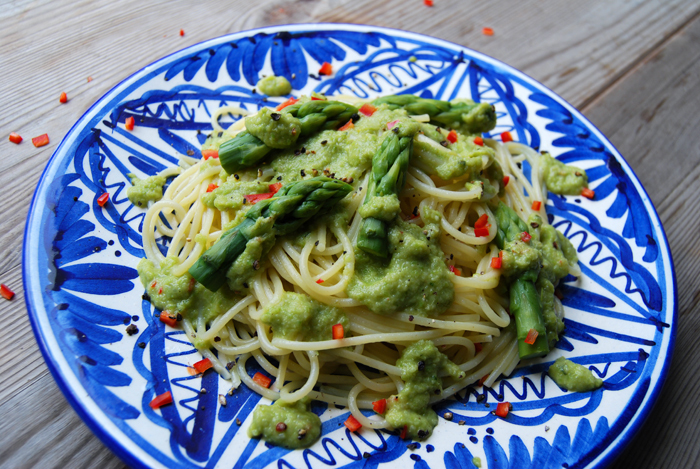 Arrange the spaghetti, pesto and asparagus’ heads on the warm plates and sprinkle with chili and crushed black pepper. water used to cook the broccoli”. Is that a mistake? I am confused. I hope you can help me. Yes, that was a mistake, I fixed it 🙂 Thank you! I never in a million years would have thought to put these combinations together…interesting. I may try this over the weekend.